This IAP, the Libraries will be making improvements to user spaces and ease of access to materials in Hayden Library. By rearranging collections within Hayden, we aim to improve wayfinding and try out new spaces for study, collaboration, and relaxation. The work is scheduled to take place during IAP (January 9–February 3, 2017) to minimize disruption for the MIT community. Popular collections (Browsery, New Books, Audio Books, DVDs, Graphic Novels, and Travel Books) will be relocated to the 1st floor, where they will be more visible. Books will be shelved in A-Z call number order in the basement, providing easier navigation for collections that were previously split between three floors and several mezzanines. Some Humanities and Science collections will be combined, including Reference and theses. Current unbound journals will all be moved to the first floor and shelved separately initially. Detective Fiction and Women in Science, Technology and Medicine (WSTM) and Grammars will be incorporated into the main collection. Bound journals and government documents will be located on the 2nd floor along with an additional scanner/copier/printer for ease of use of these collections. 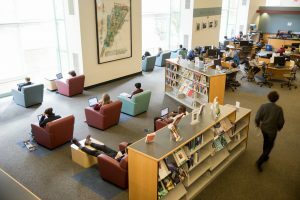 In addition, over the spring semester, Libraries staff will create new community-focused spaces in the cleared mezzanine areas. The community will be invited to try different space and furniture configurations, such as standing desks, comfortable chairs, and other suggestions culled from previous studies. To better accommodate readings and other Libraries-sponsored events, an area on the 2nd floor will feature furniture that can be easily moved. Staff will actively seek feedback and input about how these spaces work. These changes come at a particularly opportune time, as a new space planning group, one of the recommendations of the Future of Libraries Task Force, begins its work. Co-led by Professor and Head of the Department of Architecture Meejin Yoon and Chris Bourg, director of the Libraries, the group will develop a vision and set of principles for MIT Libraries spaces that reflects the themes of the task force’s preliminary report. The group will also make preliminary programmatic recommendations for potential renovations to Building 14. If you have any comments, questions, or concerns about these changes, please contact space-lib@mit.edu. If you need help finding anything in our collections, please ask at the Hayden Information Desk or contact libraries.mit.edu/ask. You can find more information about getting library materials in our Circulation FAQs.